The content in the 2017 book v6 being mostly old jokes, there is only one reference to Sailor Moon Crystal in it. I don't have enough YKYWTMSMWs to create a new book yet, so let's bring this fad back and use it to show our appreciation for Crystal, or to make fun of it if you hate it! * You look at grape soda and shout, dramatically, "IT WAS YOU!!!" * When you wake up with a cold, you throw your necklace at the door. * You know how to do the creepy Usagi stare. * ...And you win staring contests with it. * ...And you have defeated the school bully with it. 1)You make tons of amvs on your OTP(s) and post them on YouTube. 2)You make Tuxedo Kamen/Shittenou appreciation amvs post them on YouTube. 3)You make fanmade videos that expand on the Silver Millennium and/or Crystal Tokyo and post them on YouTube. i)Said videos also include Shittenou/Inner Senshi shipping. 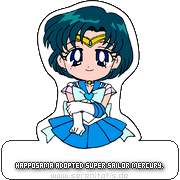 ii)Crystal Tokyo videos also hints to the Sailor Quartet as being the Shittenou/Inner Senshi's kids. 4)You make a 90's Sailor Moon vs Sailor Moon Crystal comparison video and rant on how much better one version is compared to the other. i) Bonus points if your rant on how much more useless the Inner Senshi are in Sailor Moon Crystal compared to the 90's Sailor Moon takes up half of the video. 5)You actually write Sailor Moon Crystal fanfiction. 6)You post all of the Senshi's transformation sequences on YouTube, especially Saturn's, because thank god Sailor Moon Crystal finally gave her one! 7)You download all of Sailor Moon Crystal's opening and ending themes, create a playlist and play it on repeat. i)You actually have 'Moon Pride' as your ringtone/smartphone alarm.